The high level of cellular penetration in Romania (about 140%) opens up good opportunities for entrepreneurs investing in the telecommunications sector. Despite the low rate (as little as $0.01 per minute of conversation), it's quite possible to make money terminating GoIP traffic in this country. Romania has a good GSM coverage and excellent high-speed Internet. The only thing you have to do is select the optimal tariff plan. 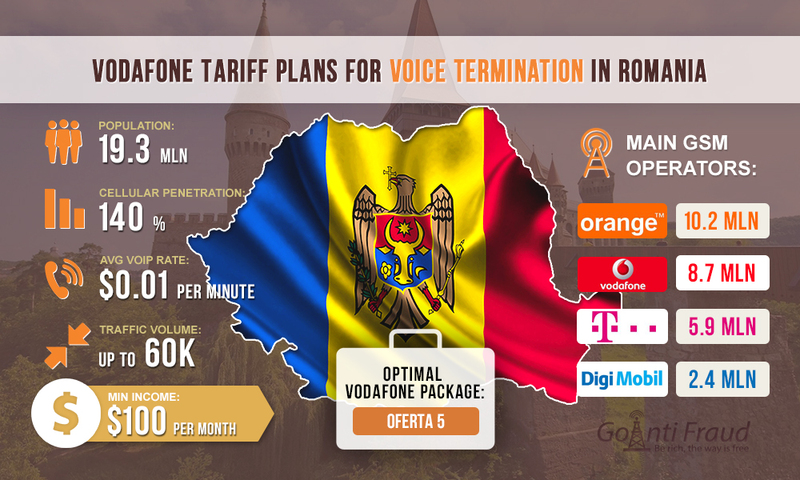 The largest GSM operators in Romania are Orange and Vodafone. The subscriber base of Orange is 10.2 million people, while about 8.7 million people use Vodafone. Information on profitable Orange packages, you can find here. Oferta 5. No-limit within the network, 1,000 minutes within the country for $5.3. Oferta 6. No-limit within the network, 1,500 minutes within the country for $6.4. Oferta 7. No-limit within the network, 2,000 minutes within the country for $7.4. Oferta 8, 10 and 12. No-limit within the network, 2,000 minutes (including roaming) for $8.5, $10.6, and $12.7. The packages differ in tariffs for international calls and the amount of mobile Internet traffic. Oferta 5 is the optimal package to terminate calls. Using it, the minute of the local call will cost $0.001 if you work for 10 hours a day). Within a month, you can make about $100 from each VoIP equipment channel. By connecting, for example, the dinstar 16 port gsm gateway, you can significantly increase your revenue.